For the second time in three months, Apple has come under fire for its decision to remove an app designed to circumvent internet censorship in the People's Republic of China. The app, called FreeWeibo, bypasses government restrictions on the Twitter-like Chinese microblogging site Sina Weibo and was pulled from the App Store on Friday, according to a report from Agence France-Presse. The app's developer told AFP they believe the Chinese government ordered the takedown. 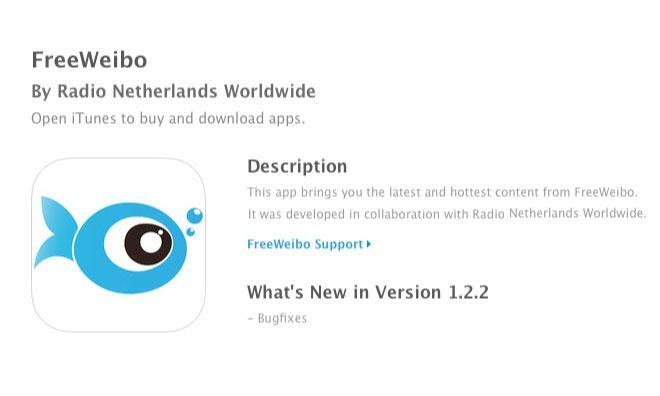 FreeWeibo, developed in cooperation with Radio Netherlands, offers "uncensored and anonymous Sina Weibo search" and ignores "relevant laws, legislation and policy," according to the service's website. AppleInsider verified the app was unavailable when accessing the mainland Chinese App Store from Hong Kong. A FreeWeibo representative told AFP that Apple's App Review Board informed the developers the app was removed "because it goes against local laws." Apple has historically erred on the side of caution when dealing with apps that may run afoul of local legislation, especially in China. In October, the company removed an app called Open Door that allowed iOS device users to bypass internet firewalls, including the so-called "Great Firewall of China." Another app that gave Chinese users access to books banned by the Chinese central government was similarly pulled in April. The Chinese market is an increasingly important one for Apple, even as controversy swirls around the company's App Store policies and the labor practices of its Chinese suppliers. Apple books nearly $5 billion in revenue from the east Asian nation each quarter, and is said to be nearing an agreement to bring the iPhone to China Mobile, the world's largest wireless carrier, in a deal that some analysts believe could add as much as $10 billion to Apple's bottom line each year.